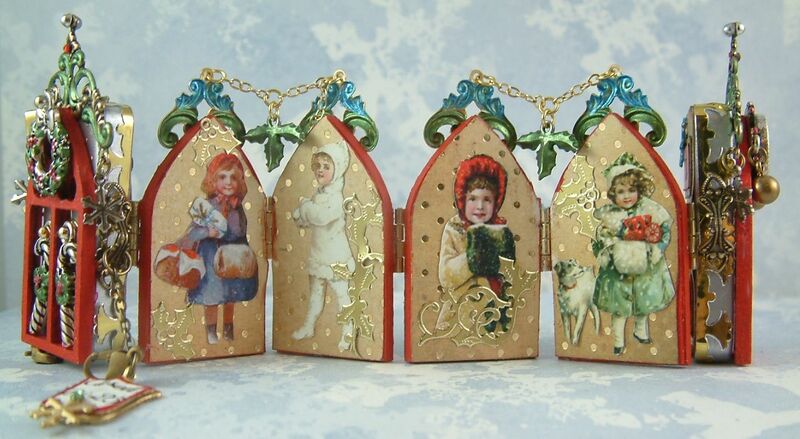 I recently participated in a matchbox ornament swap hosted by Tabitha Campbell and Caroline Ouzts-Hay. The theme was the “12 Days of Christmas”. Each participant signed up for a day and made ornaments for all of the other participants. Each matchbox was filled with all kinds of crafting goodies. 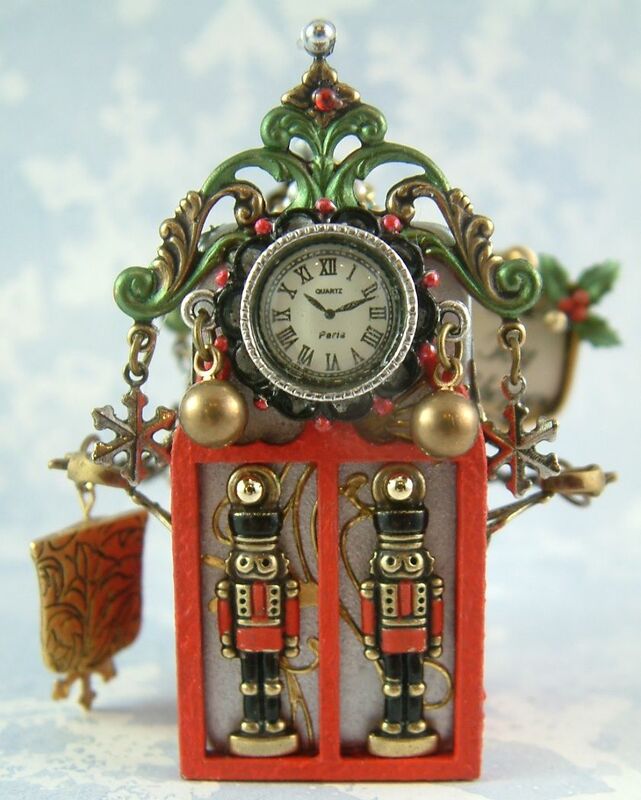 The picture above is the 12 Drummers Drumming ornament I made for the swap. I used the small matchboxes that you buy 10 to a pack. I’ve received a wonderful set of ornaments from the other participants and I’ll be posting them for your enjoyment as soon as I get all the pictures taken. 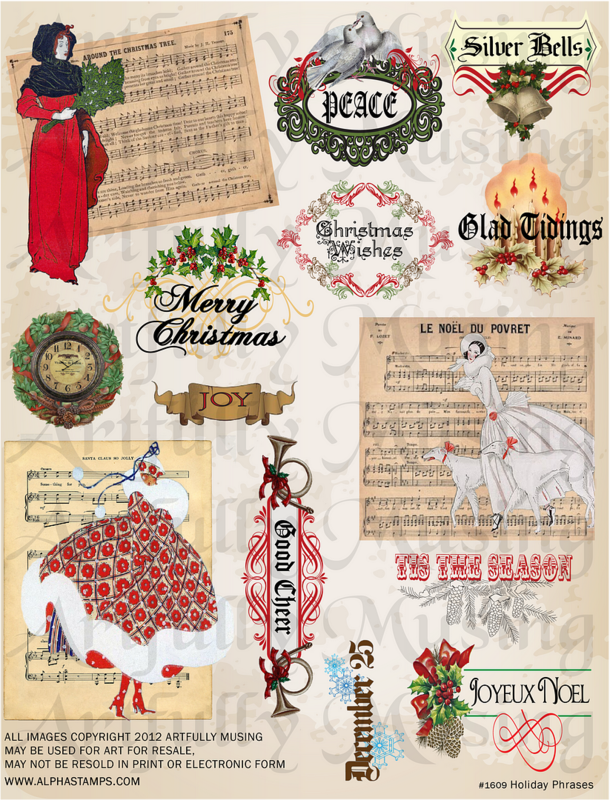 I’m happy to announce that I have created two new Christmas Themed Collage Sheets that are available now at Alpha Stamps. 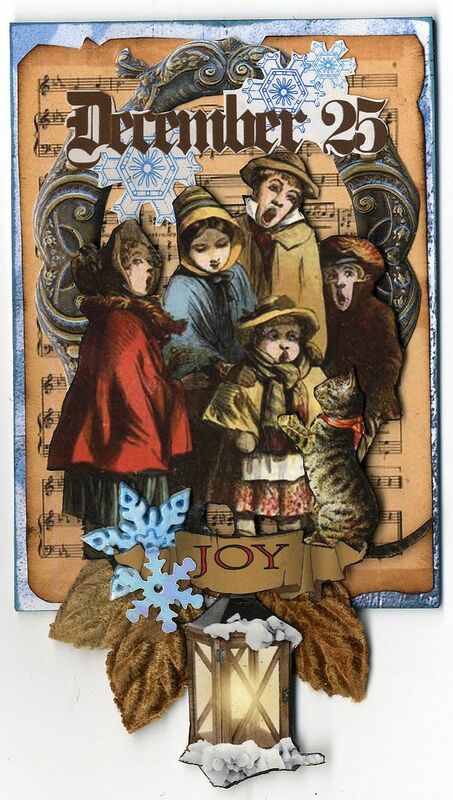 I used images from both sheets in the Carolers ATC above. 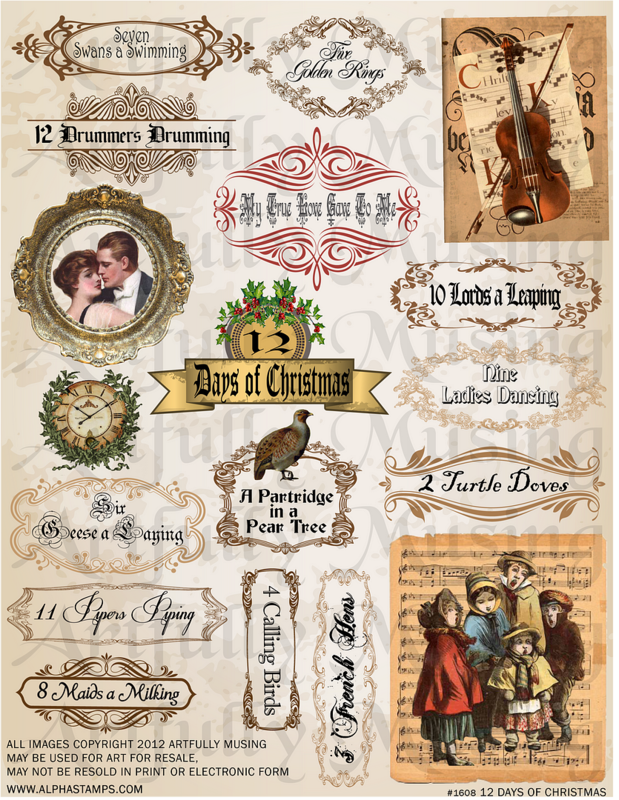 The first is a “Twelve Days of Christmas” themed sheet. The second is a “Holiday Phrases” sheet. The sheets are available for digital download, printed on high quality paper, printed on a transparency sheet or as a sheet of stickers. Click here to purchase my collage sheets at Alpha Stamps. In honor of my new collage sheets I’m giving two sets of them away. 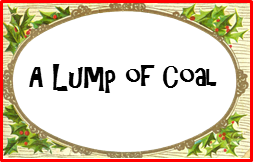 Just leave a comment on this post or email me (the button is in the right hand column of the blog) by the end of day on December 3rd and let me know if you want to be in the drawing. The winners will receive the collage sheets either printed on high quality paper or electronically (their choice). I’ll be using Random.org to draw for the winners on December 4th. Last year I created a large Victorian Toy Shop Diorama (click here if you missed it). This year I thought I go completely the other direction, as in very small, and create a Toy Shoppe domino book. The front and the back of the Toy Shoppe are dominoes with Masonite Gothic arch windows attached. In the middle of the book are 4 Gothic arch windows that are hinged together and hinged to the dominoes. The key to creating this book is gluing and patience. Since I was dealing with mostly non-porous surfaces such as the plastic (dominoes), Masonite (arches) and metal (hinges and embellishments), I used E6000 to glue almost everything. The only exception was the paper items which I used Glossy Accents if I was gluing to a non-porous surface and Tombo Mono Multi if I was gluing paper to paper. 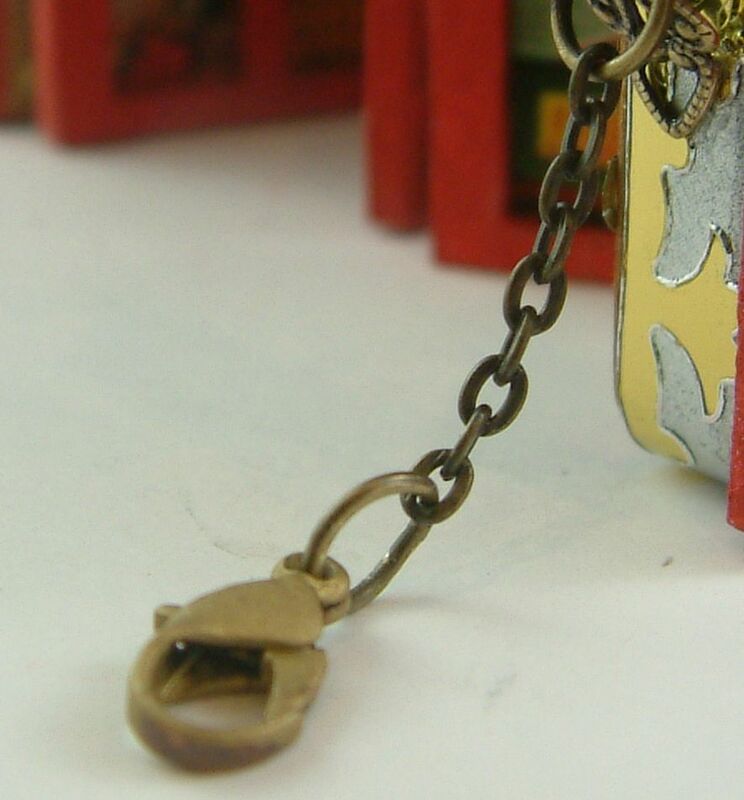 The book is held closed with a chain/clasp that is attached to fold over bails. The key to creating this book is gluing and patience. Since I was dealing with mostly non-porous surfaces such as plastic (dominoes), Masonite (arches) and metal (hinges and embellishments), I used E6000 to glue almost everything. The only exceptions were the paper items. I used Glossy Accents if I was gluing to a non-porous surface and Tombo Mono Multi; if I was gluing paper to paper. I started by inking all the surfaces of the dominoes with Silver Alcohol Mixative Ink. 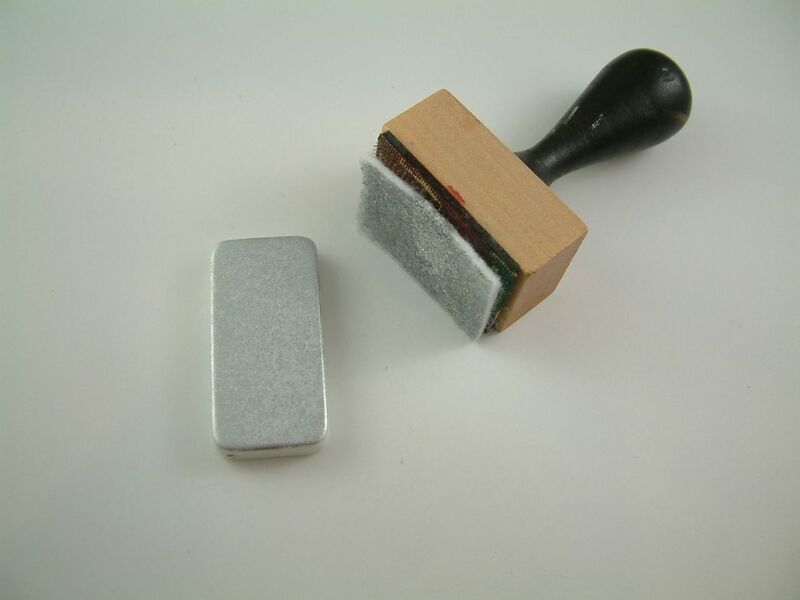 I used a wooden handle with a piece of felt attached to apply the ink. I choose this method as the ink goes on with a smooth finish. I added gold stickers to the front and sides of the dominoes. To accommodate the chains and jewelry clasps (which keeps the book closed) I bent fold over bails and glued them to the sides of the dominoes. You will need 4 bails glued to the middle of each long side of both dominos. Add the chains to the bails before gluing them to the dominos. That way you won’t be putting extra pressure on the bails trying to attach the chain. Once your book is done you can trim your chain to the proper length (to close the book) and add the jewelry clasps to each chain. I attached the two chains to the bails glued to the front domino. An alternative closure is to use ribbon instead of chain. Another alternative would be to use ribbon without the fold over bails by gluing ribbon to the backside of each domino before adding paper etc. (see the picture below). I painted all of the Masonite gothic arches red; this includes the ones for the front of the dominoes and the ones for the pages inside the dominoes. 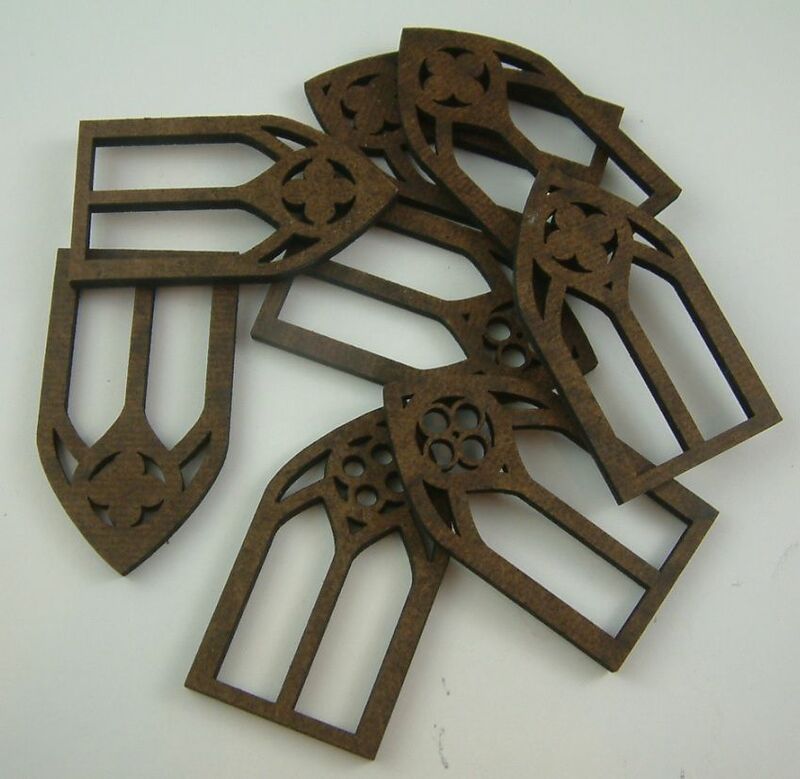 The arches come in a package of 10 and include various designs. These are the same arches I used to make bay windows for the large Victorian Toy Shop Diorama. I glued a Masonite Gothic arch to the front of each of the dominoes. I painted the various embellishments using acrylic paint. 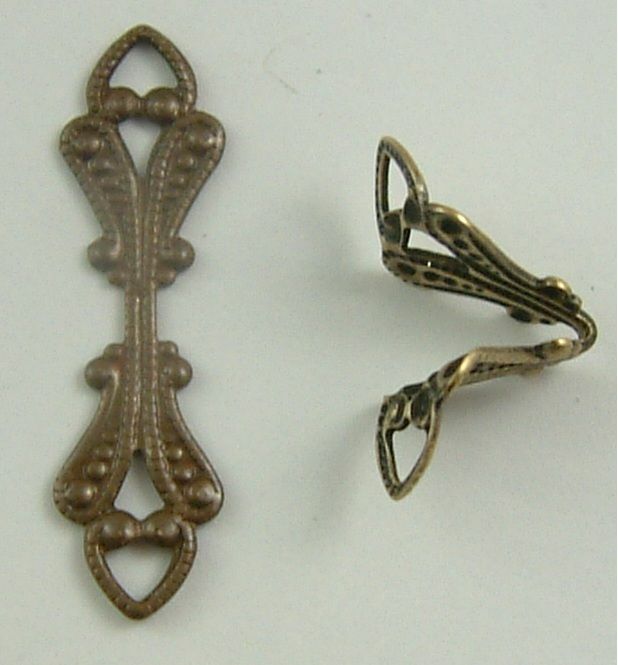 If this had been something that would be worn as jewelry I would have used products that are made for metal. But since this was an art project I went with acrylics. 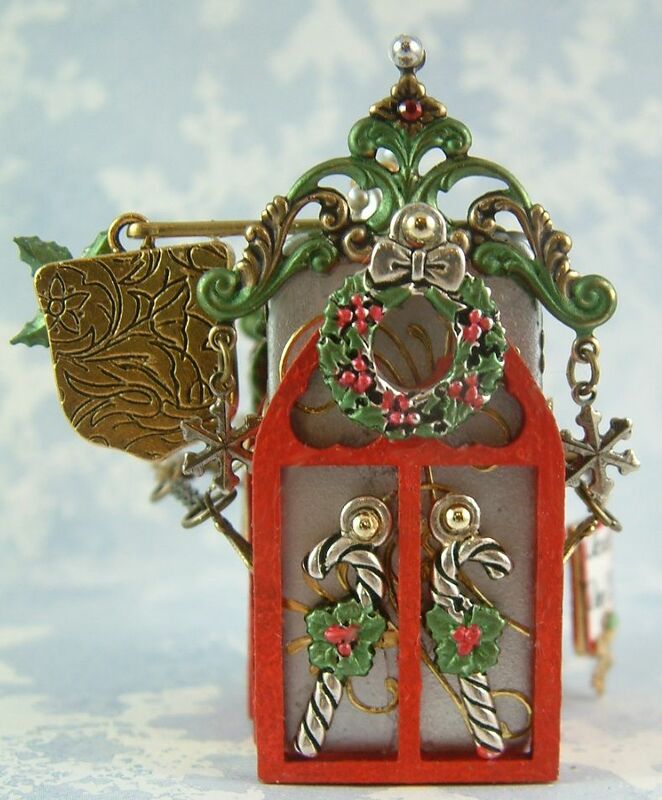 After the metal embellishments had dried, I attached all of the dangling bits like beads, snowflakes and chain to all of the embellishments etc. To make the clock I glued a clock button into a round pendant. 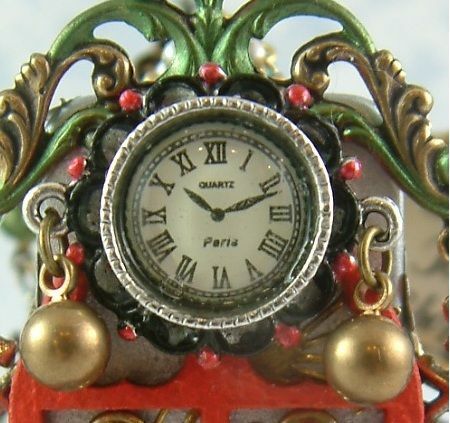 The clock had a clear domed covering. To create even more of a dome, I filled the round pendant with Glossy Accents and allowed it to dry. I attached all of the metal embellishments to the front and back arch/domino book covers using E 6000 glue and allowed them to dry. To get the strongest bond with E6000 glue you need to let it dry 24 hours or more depending on the dampness of your climate. 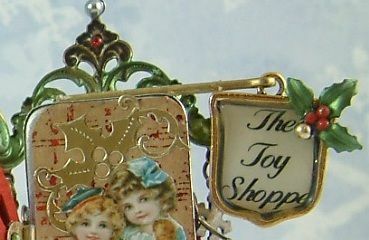 I made the Toy Shoppe sign out of a crest pendant and a cotter pin. I glued the wording into the crest and filled it with Glossy Accents. I attached the shield to the cotter pin and glued the cotter pin to the top of the back domino using E 6000. 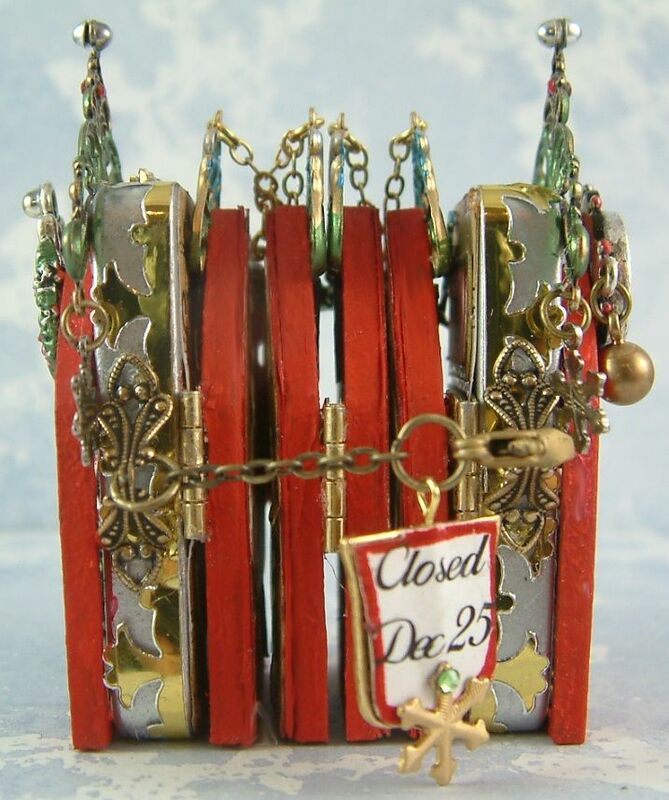 I made the Closed Dec 25 sign out of crest tag and hung from one of the closure chains. Below is the wording I used for the signs. They are sized to fit the pendants so feel free to download and use them. You need an even number of arches for the book to accordion fold properly. I would suggest using 2 or 4 arches. More arches and the book gets really thick and unwieldy. Glue the images and a piece of decorative paper to the backs of the 4 center arches. 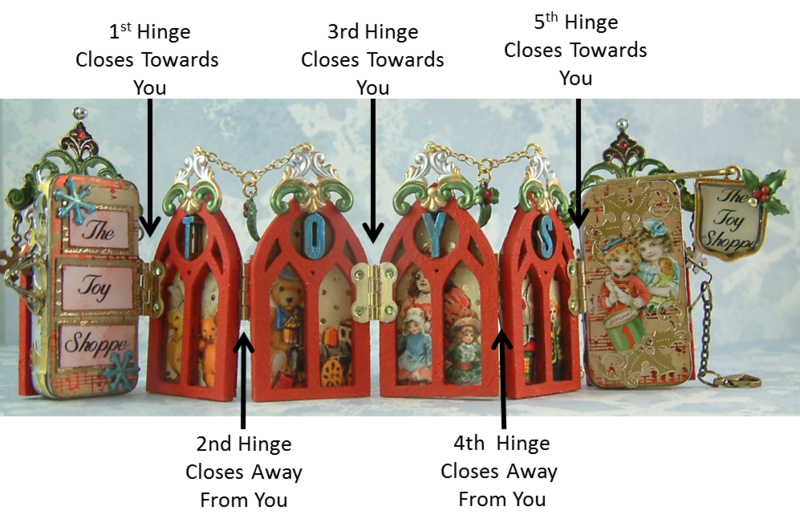 I attached the baroque scroll with loops with connecting chains and holly charms to the tops of the arches before hinging them together. Here is where patience is important. As you attach each hinge you need to give it plenty of time to dry before attaching the next hinge. You need to use very strong glue like E6000. The other important thing to be mindful of is the direction of the hinges. 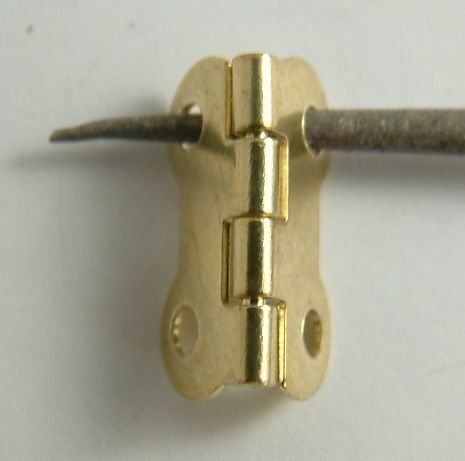 Each hinge you attach should fold in the opposite direction of the hinge before it. It is really easy to attach the hinges incorrectly (I did). The hinge closes in only one direction. In the first picture below I show the hinge closing towards you. I show this so you know what I mean when I explain how to hinge the book together. 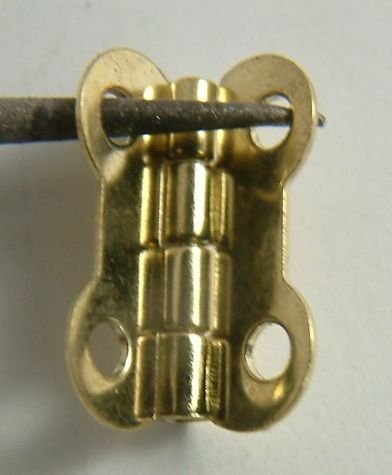 In the picture below the hinge is reversed from the picture above and the hinge closes away from you. You can either assemble the book starting from the front domino and working your way from left to right assembling each piece (one at the time and allowing it to dry) or if you feel confident you can assemble the book starting at both ends and meet in the middle. This option is also faster. As you assemble the pieces (dominoes and arches) make sure that they are level at the bottom so that you book will stand on its own. For the purpose of this tutorial I’m going to describe the order of assembly from left to right using 4 arches as in the sample book. You will need 5 hinges. Between each step allow the glue to dry completely which is probably at least 24 hours. You can also consult the diagram below for hinge placement. Attach the back domino to the hinge attached to the 4th arch. Now that your book is assembled you can add decorative paper to the inside of each domino and backs of the arches. The paper will hide some of the hinges depending on which direction they fold. On the sample, I added decorative paper inside each domino. 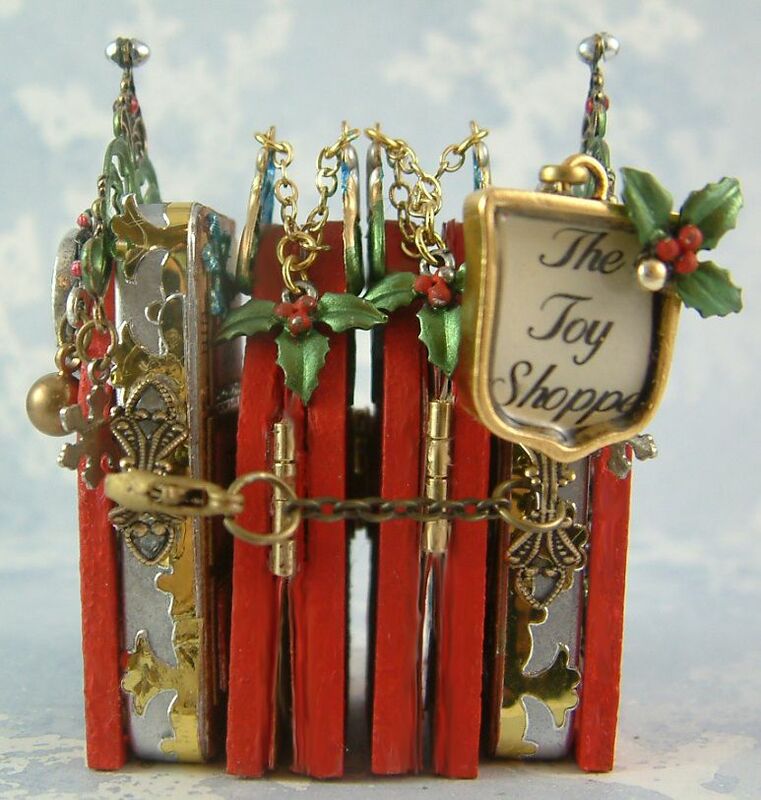 On the front domino I also added the “The Toy Shoppe” verbiage and some snowflake charms. On the back domino I added gold stickers and the image of the boy and girl. Notice how the paper covers part of the hinge attached to each domino. On the backs of the inside arches I added a piece of decorative paper, gold stickers and images. Notice in the picture below how the paper covers part of the hinge attached to each arch. I used a separate arch as a template to cut the decorative paper to size before gluing it in place. Snug in their Beds Collage Sheet – Back of book and bear. Just in time for Christmas is a fun Matchbox Chest Advent Calendar project that can be enjoyed by your entire family. 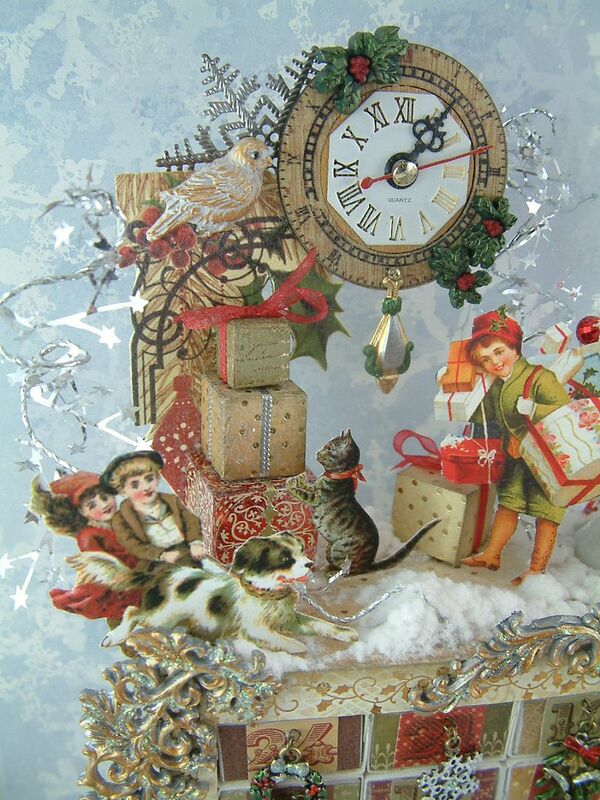 I learned about advent calendars when I lived in Germany as a child (my dad was in the military and was stationed there). 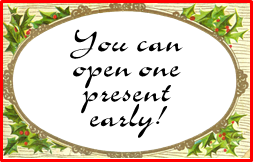 My mother would purchase a calendar each Christmas and my sister and I would take turns opening a door each day and eating the chocolate it contained. 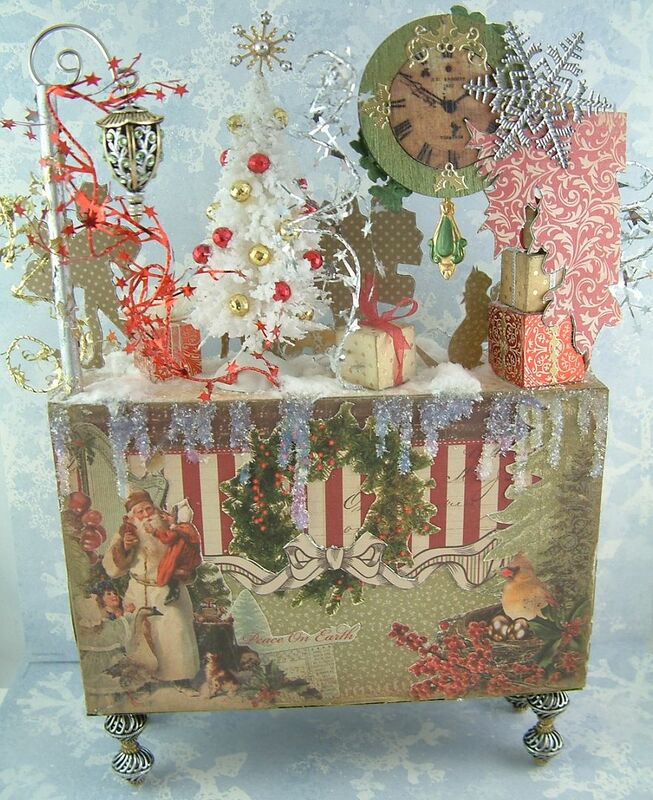 I thought my matchbox chest project would make a great advent calendar project. 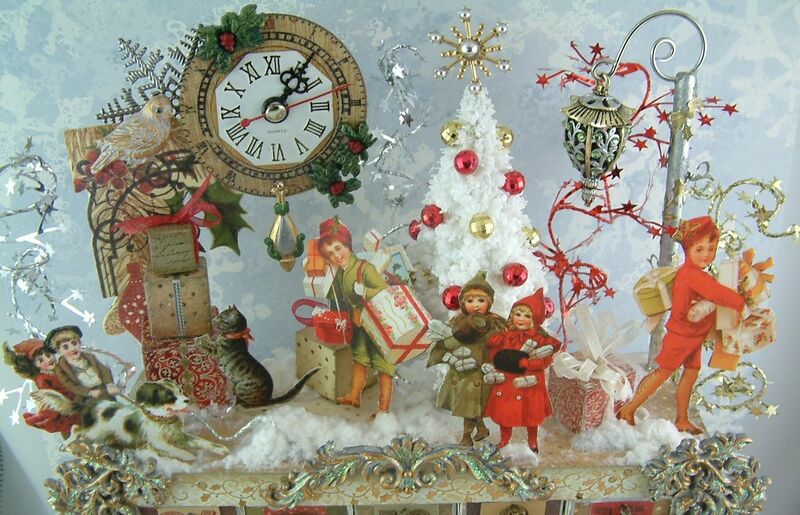 If you are not familiar with advent calendars they are calendars that count down the days until Christmas; starting on December 1st and ending on December 25th. 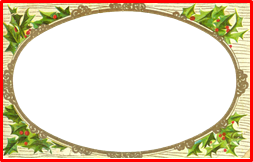 Most have doors that when opened; reveal a piece of chocolate or a Christmas themed image. The charms are the drawer pulls. To see the number or date of the drawer you just lift the charm. The numbers are not in order as I think that is more fun. 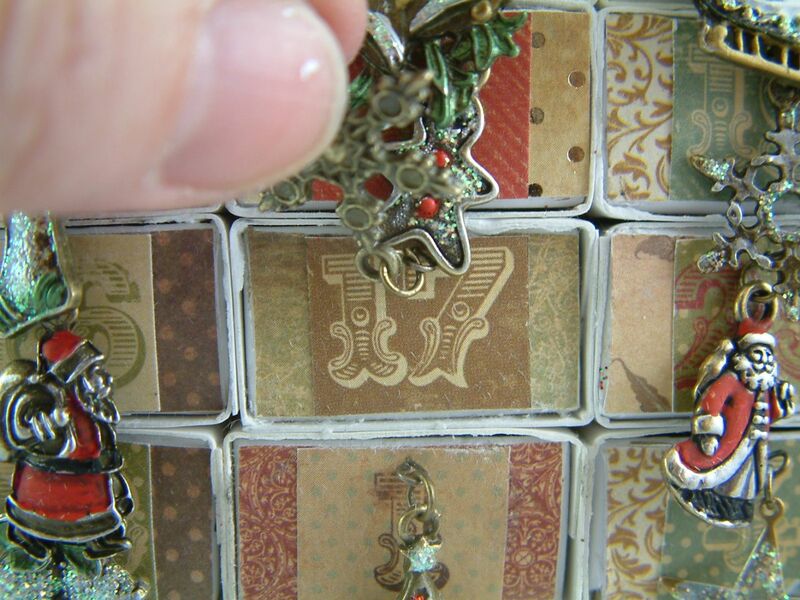 In this post I’m going to cover the differences between the matchbox chest I demonstrate in the video tutorial and this Matchbox Advent Calendar Chest. For general information on how to make a matchbox chest you can watch my video tutorial. At the bottom of this post is a complete list of products I used for this project that are carried by Alpha Stamps. For this project I used a different matchbox than the one I used for the matchbox chest tutorial. 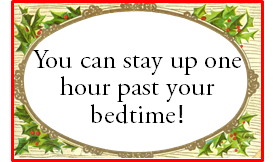 I needed a larger font to accommodate the day of the month and the Christmas charm that acts as a pull. You can see in the picture below the difference in the matchboxes. The one on the right is the one I used for the advent calendar and the one on the left is the one I used for the matchbox chest. The one I used for the calendar is 2 ¼” long x ¾” tall by 1 ¼” wide. Alpha Stamps is carrying them and they come in a box of 8. You’ll need 4 boxes to make this cabinet. 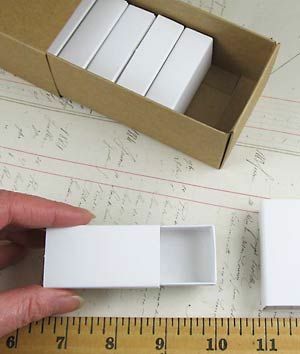 The container that the individual matchboxes come in, are also a large matchbox. Stay tuned for another project using the larger matchbox container. Using this matchbox had two other advantages; I could insert larger objects in the box, and all of the surfaces where white which worked well with the Christmas theme and required no inking or papering (except the front of the drawer) which made the project faster. I did this for a couple of reasons. First, it gave me a nice deep frame around the front of the chest to accommodate the paper and embellishments. You can see in the picture below where I have glued the Antique Silver Leaf Flourishes to the front of the cabinet. 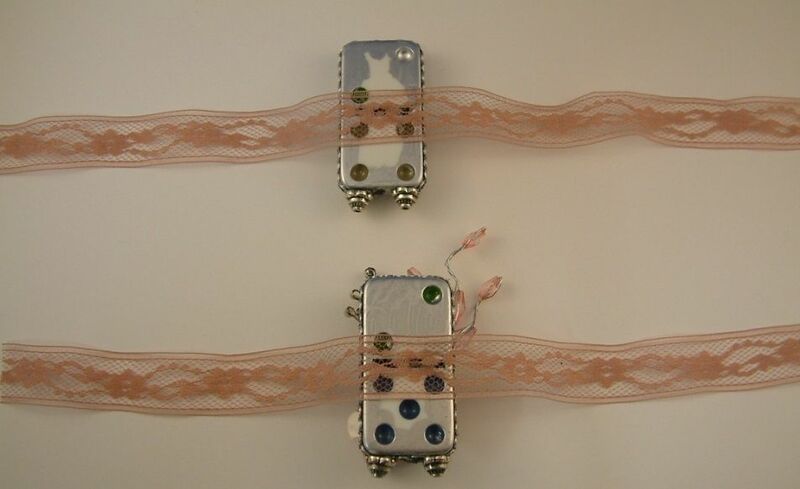 These were originally silver, I added some gold and then Diamond Stickles in the grooves for sparkle. 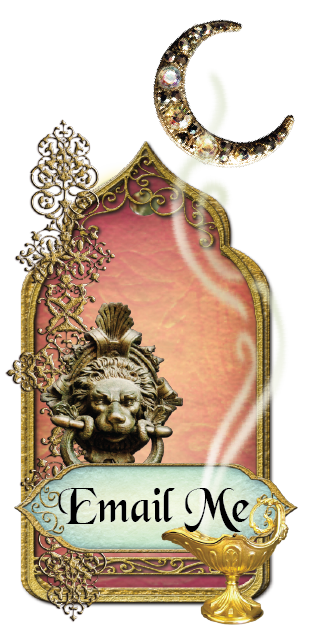 Second, it gave me a surface that I could easily poke with a pin to insert dimensional embellishments. One of the tricks I use to get paper images to stand up by themselves is to insert a pin in between the image and the backing of cardstock and or decorative paper. In the picture below I used this technique to attach the images to the top of the cabinet. The Star Tinsel is wired so you can strip off the coating and stick the wire into the foam core as well. 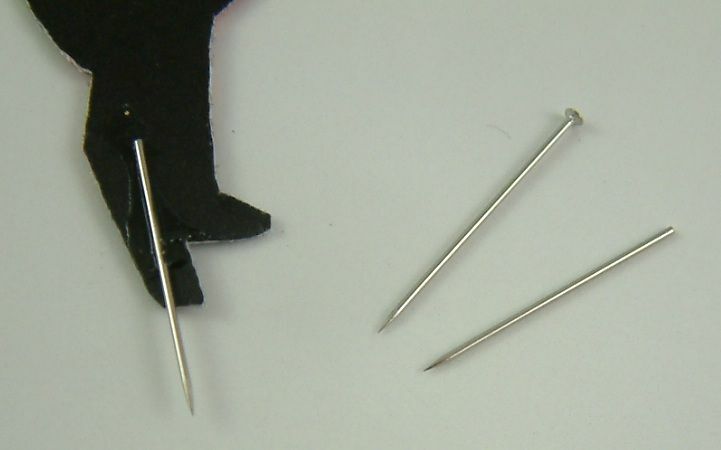 Snip the head off of a small straight pin. Glue your image to a piece of light cardstock. You want to use light cardstock because by the time you have all three layers together it gets hard to cutout the image. The light cardstock makes the image stiffer but not too hard to cut out. Cutout the image. Glue the pin to the cardstock at the point where you want to attach the image to the foam core. I used Glossy Accents. 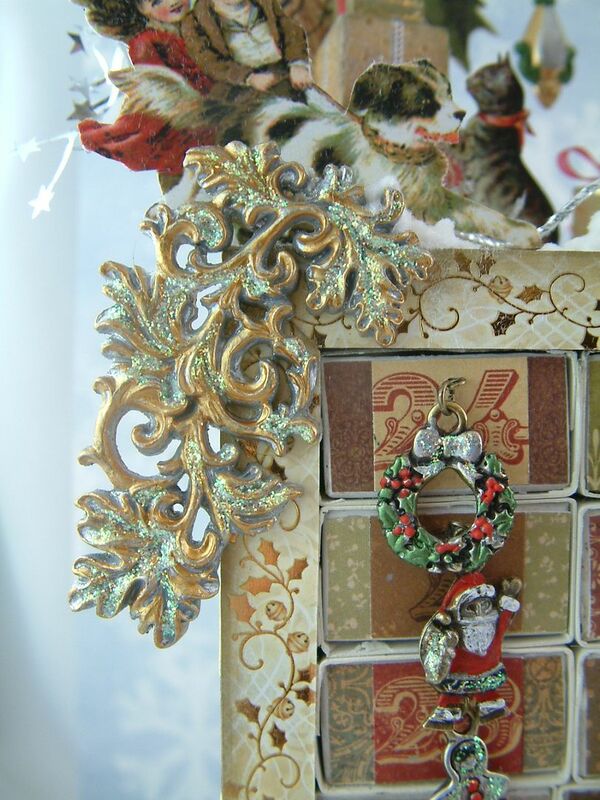 Glue the cardstock to decorative paper. This is so that it will look pretty from the back side. Another option is to print the image in reverse and back the original image with a reverse of that image that way it looks the same from both sides. Now you are ready to add the image to the chest. To attach the image to the top of the chest I pre-poked a hole with a needle then inserted the image with the pin into the hole. Voila! 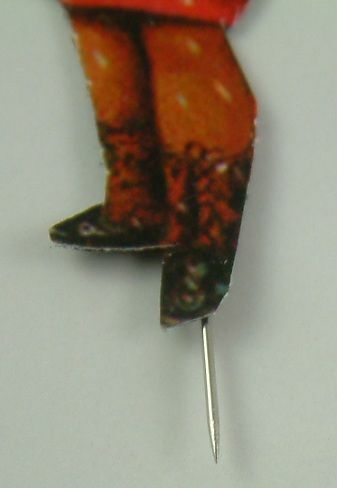 The image is standing by itself, it looks good from both sides and you can’t see the pin. You all know how I love adding feet to my projects. For the chest I used two beads glued together. I thought the beads looked like Christmas ornaments. These beads have large holes so I inserted a wooden skewer (painted with Silver Alcohol Ink) to give them more stability. I added a little Glossy Accents to the dowel before sliding it through the beads. I sniped off both ends of the dowel so that it was flush with the beads. I painted parts of the beads with Gold Alcohol Ink. 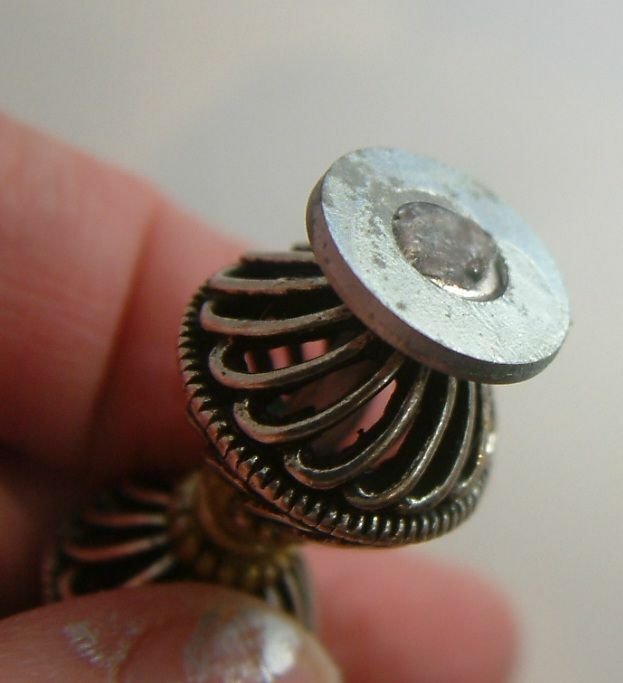 Before attaching the beads to the bottom of the cabinet I glued them to a silver washer. This was to give me more surface area to glue the beads to the bottom of the cabinet. Just gluing the tip of the bead to the cabinet did not provide enough surface area to make the feet stable. The front of the drawers is the only thing decorated on the matchboxes. The white of the boxes matched my color scheme. I used the number stickers from the Turtle Dove line for the numbers on the front of the drawers. The charms act as the drawer pulls. Lifting the charm reveals the number or date. All of the charms were originally a gold color. I jazzed them up by adding silver, red, black and green paint and Stickles for sparkle. 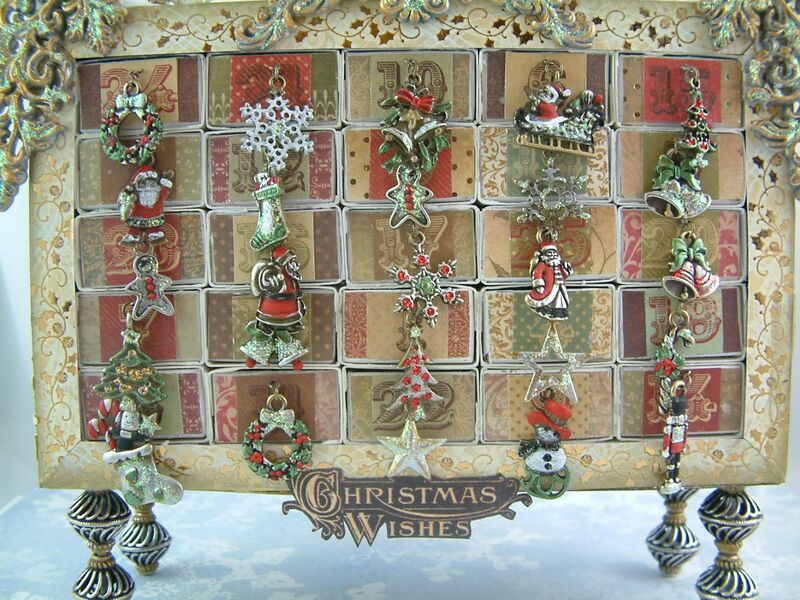 Paper lines that would work well for this project are: Joyeux Noel 6x6 Paper Pad and Festive 6x6 Paper Pad – These are the papers I used for my Christmas Mini Albums & Bookshelf Tutorial. Click here to see the tutorial if you missed it. Two others are: City Sidewalks 8x8 Paper Pack and Santa Journey 8x8 Paper Pad. You can fill your drawers with whatever you like such as candy or small presents. 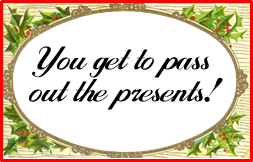 I also thought it would be fun to have other types of treats or prizes such as getting special privileges like being the one to pass out the presents (this was a big one in our house) or being allowed to open a present early. Below are some of the ones I could think of. Feel free to download the images and use them as prizes in your calendar. 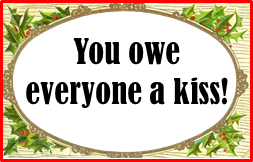 I also included a blank one in case you want to create your own. They are sized to fit the matchbox drawers or you can roll them up and tie them with a ribbon (prolonging the suspense). Pulling from a grab bag would be a great way to deal with items that are too big to fit in the drawers. There is a lot of space at the top of the cabinet to add whatever you desire. I certainly had fun filling it up will all kinds of stuff. As I discussed previously, having a foam core top made is so easy to attach elements like the images and the Star Tinsel. The tree comes already flocked in white. I cut up Mardi gras beads and glued them on the tree with Glossy Accents. The lantern (oh the lantern)….I LOVE this lantern and you are going to see it again and again in more of my projects. The pole is a wooden dowel. I cut a notch in the top of the dowel and glued the ornament hook in the notch (using E6000 glue). The lantern was original all gold. 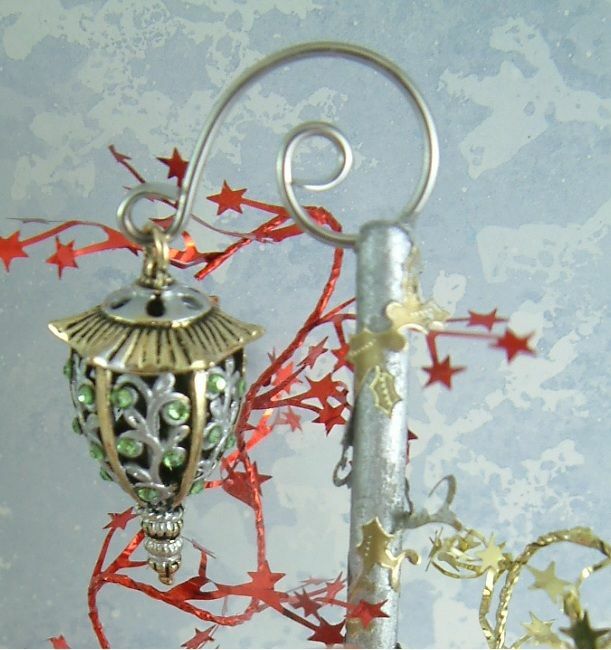 I used Silver Alcohol ink to paint the scrolls and then added green crystals. With the top of the cabinet being foam core it was easy to punch a hole in the top and insert and glue the dowel in place. I decided to add the packages (which are blocks of wood covered in the Turtle Dove paper) to give me a way of suspending the clock. The paper die cut (from the Turtle Dove line) is backed with light cardstock and decorative paper (to make it stiff). 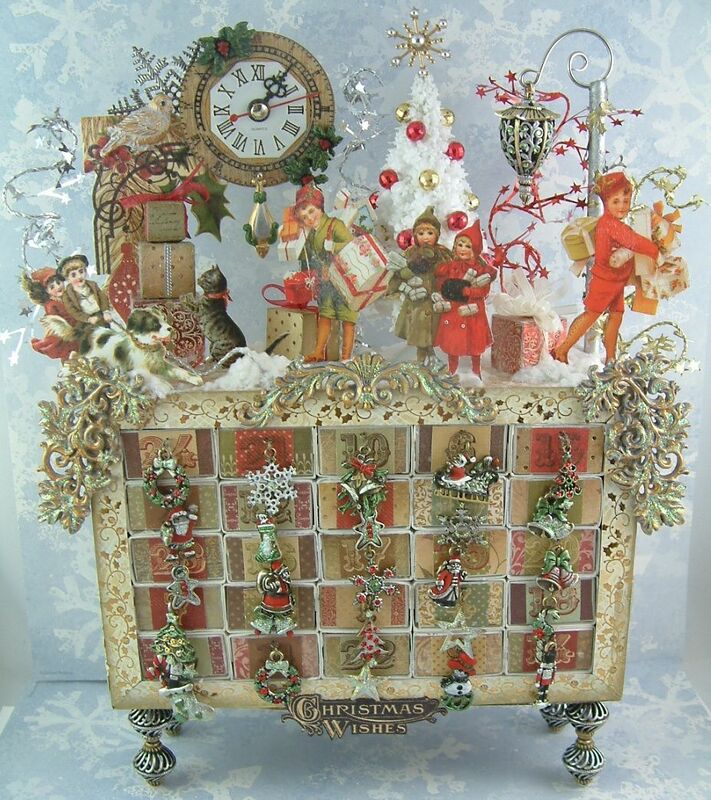 The packages are glued to the top of the cabinet, the die cut image is glued to the packages and the clock and other embellishments are glued to the die cut image. My thought process started with me wanting a clock and then I worked backwards to figure out how to hang it. The swirls in the die cut image made me think of a decorative pole so I just needed a way to anchor it to the top of the cabinet and that’s where the packages came in. The whole assemblage was too heavy for my straight pin trick. I used the decorative paper die cuts to cover the sides of the cabinet. Because the sides are foam core you could use the same trick to poke stuff in the sides as in the top. I added snow to the top of the cabinet by drizzling Glossy Accents on the top and then sprinkling the glue with white flocking. What I didn’t realize is that some of the glue dripped down the back of the cabinet. Eeek!!! My solution was to add more glue to the back and sprinkle it with Diamond Dust to create ice cycles. Problem solved! I hope you have fun creating a cabinet for your family and enjoying it for years to come.